Building a successful business takes work. In order to outperform competitors, businesses today need to ensure that they implement the essential strategies to effectively build partnerships, intellectual resources, to promote an idea, product, or service, with the objective of creating value for their business. The first thing that businesses should realize about these techniques, is that they all rely on effective communication. Communication is important in everything, especially in the business world; poor communication and lack of feedback can lead to frustrated customers, unmotivated employees and a negative corporate culture. Thus, companies should always prioritize business feedback. It is important for businesses to receive and give business feedback. But to whom, and from whom? Customers are among the best people to receive feedback from. Because they are the ones who use your product or service, they will most likely see it in a different perspective. By inviting them to give feedback, your company may learn something new. Perhaps customers will have comments about potential improvement that your company has never even thought of, or things that will improve the way your business is perceived. 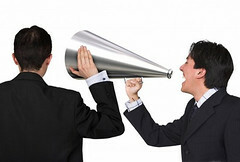 Businesses should also ask employees to provide feedback. Employees who are given the opportunity to provide feedback feel more valued, and therefore, are more productive. Since employees are the ones who work with customers, they may also be able to provide insight as to what is working and what is not. When customers give business feedback to a company, they are often left wondering whether it was worth their time doing so. It’s a good idea to give customers feedback on their feedback; this means letting them know you have received their feedback, whether you like their idea, and if you will work on it. Business feedback doesn’t always need to be about your company’s product or service. To ensure effective team work, business communication and good working relationships, business feedback can be about workers’ performances. It’s important for any worker – an employee, a manager or business partner – to know how they are perceived. This improves the work relationship, which makes businesses stronger. OneDesk makes giving and receiving business feedback easier. This social business software allows for two-way collaborative interaction, and facilitates teamwork and communication. With OneDesk, customers can submit feedback to companies, through the customer feedback application. The company can then immediately let customers know whether like their idea, and if they will work on it. Employees and business partners can be invited to join a project and submit feedback. From there, they can view and join conversations regarding product feedback from customers, and submit their own. A project can be created just for employees, to collect work-related feedback. To learn more about improving communication, teamwork and implementing a better feedback collecting process, try OneDesk for free today.